CHIROPRACTIC & SPORTS REHAB P.C.! Call us at 662-236-2295 today. Located in the heart of Oxford, the leading health professionals at Henderson Chiropractic & Sports Rehab, P.C. are dedicated to helping you achieve your health objectives -- combining skill and expertise that spans the entire chiropractic rehabilitation spectrum for over 16 years. Dr. B. Tripp Henderson is committed to bringing you better health and a better way of life by teaching and practicing the true principles of chiropractic care. Patients seeking treatment at Henderson Chiropractic & Sports Rehab, P.C. are assured of receiving only the finest quality care through the use of modern chiropractic equipment and technology. Dr. Henderson and the staff have a genuine concern for your well-being! If you are new to our website, please feel free to discover and learn about chiropractic rehabilitation. If you are interested in starting your journey towards wellness please subscribe to our award winning newsletter. If you are already a newsletter subscriber, please explore the member wellness section of our website for articles, resources, and health facts---specifically targeted by Dr. Henderson to your wellness needs and interests. Dr. B. Tripp Henderson D.C., C.S.C.S. Dr. B. Tripp Henderson is a National Board and MS State Board licensed Chiropractic Physician as well as possessing an additional post-graduate training and certification in strength training as a CSCS (Certified Strength & Conditioning Specialist) through the NSCA (National Strength & Conditioning Association). He has been freeing people from pain in his clinic in Oxford, MS since 2001. Everything from children in local sporting events to the 'weekend warrior' has been helped. He has had the privilege of working with the Ole Miss athletic program, as well as professional Athletes' including players from the NFL, MLB, NBA, Olympic gold medalist from the 2012 Olympics in Rome as well as other professional musicians that have come to Oxford to record. As a Chiropractic physician with experience and additional post-graduate training, he is committed to returning and promoting the health and well-being of his patients. "I went to him a few years back and he fixed me up, I made it all these years just fine till awhile back so I went back to him today and can tell a big difference already. I hope I don't offend him tho with my sense of humor, I make a joke about everything. All in all he really knows what he's doing and I highly urge anyone having back trouble to see him." "I went to this clinic for shoulder pain. I was apprehensive about going to a Chiopractor. I am happy to report after my adjustments (2 per week for about 3 weeks) and an exercise program I am MUCH better. I can sleep at night and go through the day with very little discomfort. The staff and Dr. Henderson were wonderful. Hopefully I won't need this care again but I won't hesitate if I have joint aches and pains again." "Trip & his staff have been a lifesaver for me many many times!!! Thanks for always making me better���Thankful you're a phone call away!" 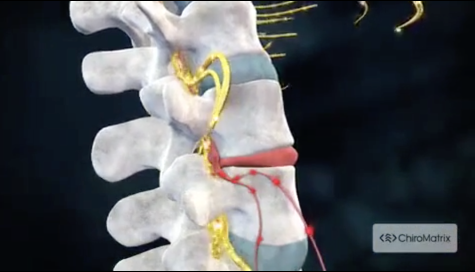 We are proud to offer DTS Spinal Decompression Therapy. Click on the image above to find out more!